Alex Acuña – percussion on "Famine"
Joakim Svalberg – piano on the track "Heritage"
Björn J:son Lindh – flute on "Famine"
Swedish band Opeth has managed to achieve quite a lot during their career, they have one awards, played lots of live shows all around the world, been on the Billboard lists and so on an so forth. They have also managed to release nine studio albums, of course discounting the one I have placed under my microscope today. That album, the tenth studio album by Opeth is called Heritage and about it singer, writer and some more Mikael Åkerfeldt said: it feels like I've been building up to write for and participate on an album like this since I was 19. That sounds interesting I would say, and there’s more interesting stuff in the album cover which is something Åkerfeldt has been a very big part in the making of. It is a tree that signifies the band now and how their roots go down to hell and so on, I let you make up your own mind when you buy the album and view it more closely. It is not the easiest thing to describe how Opeth sound and they have changed a bit seen over the years as well being rooted in the death metal to begin with and then they have mover further and further away from those roots but still in a way holding on to them. I know one Opeth album well since before this one and the other ones I know somewhat well also. “It's quite intense at times in some 'old' murky way, and quite beautiful and stark at times.” Last sentence is the description made by Åkerfeldt about the album, he also says: “I think you'll need a slightly deeper understanding of our music as a whole to be able to appreciate this record.” I would say that it sound like Opeth but also not quite like we use to know them, only one time before there have been no growls which is the case on this one. The sound is also a tad more raw, it sounds a bit cheaper and almost a little empty compared to the massive wall of sound on an album like for instance Blackwater Part which is the one Opeth album I own and know best. There are also lots of additional parts lent from other genres, there are quite a few folk musical parts to be found on this album, pianos and everything you could ever imagine almost. The album has ten tracks (there’ll be some bonuses on some editions), and it is almost 57 minutes long. I am not quite the Opeth knower as some might be, I have just a shallow knowledge and recollection of how most of their albums sound but I still do feel like I am getting much out of this album, can Åkerfeldt be in error or is it just my broad musical taste that makes it easy for me to take in. “I guess it will raise a few eyebrows and it certainly is an acquired taste” says Åkerfeldt as well and I think that is also a bit odd since it would say that you need to listen to it many times and not really like it to begin with, I liked it from the first couple of minutes. Though I think it is an album that require some time to really get into as it has many nuances and angles to discover, also the atmosphere is just as good as it usually is with this band and I think that particular thing is the real strength of this album as it tends to get you into just listening to the music. There is no real standout track on the album and I believe that is intended as I read on wikipedia that Åkerfeldt didn’t want to release any song before the album as he thought it should be heard in its entirety, he also didn’t want to play any track live before the album was released as he did not want any bad copies of the songs to circulate on youtube before the album was out, if we are to believe that “reliable” source I have no clue where the quotes came from in the first place. I do however want to mention the intro track which is the title track and the second track called The Devil’s Orchard which is really good and then the ending track called Marrow of the Earth which ends the album really well. These tracks are not necessarily better than the rest but I think they are worth mentioning anyway as they have a special feel to them but may just be because of the position they have on the album. 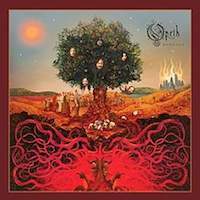 It sounds different than Opeth but it still has that Opeth sound, there are no growls but you will not miss them, it is a rather quiet album but that suits the songs perfectly. It is an album that should be played in its entirety to really reap the strange fruit from the tree on the cover of it, an album to really listen to and not just put on in the background; it does not really work as background music to be honest. Almost an hour’s worth of musical adventurism that I am sure anyone who have enjoyed Opeth’s earlier albums will really enjoy. I don’t think there will be many buyers who will be disappointed with this album, but then again I am not like the rest so it may be that it is only I who like it along with the band themselves. For me this is an album that feels given on the top ten over this year’s best albums, for you it is a given purchase.